Plants really don’t move. The majority grow in the same places, look the same, smell the same, and act the same for thousands of years, and this slow evolution is a useful lodestone to help us navigate the shoals of botanical thought, which have changed so dramatically in the past 600 years as to be scarcely recognisable. An example of unrecognisable botany is found in the Parker Library MS 395 (https://parker.stanford.edu/parker/catalog/nq795kd7274), which contains three full-page illustrations of “lunarias” – four types of plant which we now consider to be entirely unrelated. Two of the illustrated pages appear with explanatory texts in early Catalan, and were probably created at some point in the 15th century in the South of France, but the first page (on the verso of 49, below left) has no explanation. The absence of roots, along with clumsy attempts at copying the face of the moon in this first leaf, lead me to suspect that the first leaf illustrations were drawn later, in order to fit an accompanying text on fols 48v – 49r, the latin text, De virtutibus lunariis [“On the virtues of Lunaria”], into the authority of the earlier manuscript. Judging by the hand, this text was written into the manuscript in England, around the time that the manuscript travelled there in the second half of the 15th century. As Linda Voigts identified in “Plants and Planets: Linking the vegetable with the celestial in Late Medieval Texts”, the Tractatus de virtutibus lunariae is not part of the herbal tradition, in which plants were identified to be of use as medicine. It appears to be part of a different manuscript tradition, closely related to alchemy, in which one single plant, or a group of plants, derived powers – curative, alchemical and magical – from a specific planet. Most of the treatises found in England deal with Lunary/asterion under the power of the moon, and mortagon under the power of Mars. The majority (fourteen) of these treatises are in Middle English, and it is unusual to find one in Latin. The Tractatus explains the names of the lunary plant around the world (“In Greek it is called Eliotropia. In Arabic and Chaldean Ibernica. In Saracen, Mortagon”) and goes on to explain how it grows, and its thirteen virtues. The leaves appear one by one as the moon waxes until there are 15 leaves, and then as the moon wanes the leaves disappear, again, one by one. “Finally it remains as naked as it was when it sprouted from the earth.” The illustration on 49v shows this gradual gaining of the leaves according to the stages of the moon, and it also seems to show the leaves opening out in the light of the sun. The thirteen virtues get steadily more abstract, culminating in the use of the leaf to open the gates of the underworld and the root closing them, but an annotation clarifies this universality by saying that the virtues of the “first matter” are being discussed “metaphorically, under the appearance of a plant”.. So why might someone want to associate this text with the earlier Catalan illustrations? Firstly, the quality of the illustration is certainly high, and the manuscript must have had some considerable value for it to have travelled unharmed to Cambridge from the South of France. The illustration on the facing page (50r), titled “de lunaria” shows changes in the plant in starlight and moonlight, leaves and seeds falling off under the moon The elegant young man on this leaf is holding a frame in which there is a Catalan inscription: Certes alli desa se troba que es stellaria e lunaria. La qual yo se p[er] estrologia “certainly there above one finds that it [there?] is stellaria and lunaria. Which I know through estrologia [astrology?]”. The plant is highly stylised and it seems clear that it looses its leaves, seeds and a sort of tuberous root at some point in the transition from the moon to the stars, but why it does so appears to be a mystery, nor does the type of plant give us any clues – it is hard to identify with any known species. Over the page however, the plants that are illustrated are readily recognisable; Soldanella alpina, on the left in the illustration below, grows across mountains in northern europe, (and is now a common garden introduction in the U.K.); Botrychium lunaria, at the bottom right, is a fern most people who have walked across mountains in scotland or wales will have trodden on; it is also a plant of high, damp places across northern europe. The middle plant is more obscure, but (if the illustrator had made a mistake over how toothed the leaves were) it could be Herbe Paris, Paris quadrifolia, which has 4 leaflets on a smooth stem from a creeping rhizome, and grows also in damp places in northern europe, as well as more eastern parts of the british isles. This page looks strikingly like a page from a herbal manuscript, and the text either side of the stalk of the Soldanella alpina (left) seems to link the flowers into the herbal traditions: “Aquesta es la lunaria blaua. pro tam fa la floreta blaua. E axi obra da e daytal figura e daytal grandesa e poquesa.” “this is blue lunaria, because it has blue flowers, and it’s this sort of shape and size.” This was an usual, if unsophisticated, way of describing a plant. A herbal in the Parker library, the beautiful little Tractatus de virtutibus herbarum, printed in Venice in 1499, says of the Iris in the same way, that it has “large purple flowers, or white ones, according to the type”. E segond los lombarts e venetians es dita talt maios. E la epatica es dit talt menos pro com son maiors les priepetas daqsta mas la epatica lacunda seguir en operations “And the Lombards and Venetians call it greater talt and they call the ‘epatica’ lesser talt, because the properties of this one are greater than the epatica in operations. The “lesser talt”descibed here is probably the plant that is now called Hepatica nobilis, an anemone with similar blue flowers, called hepatica or liverwort because the three lobed leaf was thought to resemble the human liver. This sort of description, identifying the plant with its various common names, the plants that look similar to it, and subsequently attributing virtues to it, is again common in herbals. In contrast to this, the text to the lower right is more alchemical. Botrychium lunaria, the fern that we now know as moonwort, has long been identified with the changing of metals, as has been explained in an earlier Parker library blog https://theparkerlibrary.wordpress.com/2017/12/12/the-billingford-hutch-and-the-moonwort-fern-a-medieval-mystery-solved/). The first part of this annotation is easy: Aquesta es reymerola o lunaria menor. Aquesta ha virturia de dissolve totes opilationes This is ‘reymerola’? or lesser lunaria. This has the power to dissolve all opilations. The power to dissolve “opilations” – obstructions of the liver or other major organs – was something attributed to many plants in early herbals. The Tractarus, for example, tells us that the Iris can clear opilations of the spleen and liver [io ualet cotra opilatione splenis & epatis]. The next part of this paragraph becomes alchemical. Hoc encara fer tornar largent. Vim en agyua quen metats del such mya cullerada sobre tres liures del mercury. E que estigua per tres tornes natural serena. This face turns iron into silver. Eight leaves in water, then five spoonfuls of juice on three measures of mercury. And let it sit for three moons [or until it clears?]. However, it is still a recipe, and not the precise metaphorical causation described in the lunaria manuscripts. In the upper right hand corner of this page things get more obscure. La quartar lunaria es aquesta Ero la trobaras cerqua la lunaria dius. iX. passos entoun della tar derevt la una es de laltia ne la una ne pot estar senslaltua. The four [leaved?] lunaria, is this which can be found around the lunaria “dius”. 9 paces around her, because the one is from the other, nor can the one be without the other. This seems mysterious, possibly because the translation is incorrect. It is just possible that the plant is some form of parasite or in a symbiotic relationship with a“lunaria dius” plant, and therefore unable to exist more than nine paces away? But without understanding the “lunaria dius” more clearly it is not hugely revealing. Finally at the bottom we have a final note: Martagon tael de safia bort. Qui ha nom muktas o allaria. Totes infernes pastades e fer dsree segons que sabets. Martagon is a different wort. Which has the name muktas, or allaria [Allaria officianalis, garlic mustard?]. All illnesses are made better by this paste according to those who know. This final paragraph appears to be in direct contradiction to the text of the Tractarus, which states that lunaria is also called martagon. It also directly contradicts the messy annotation “martagon” which is slightly to the right of the plant. What I suspect is that the initial illustration and neat annotations in Catalan were created in the South of France by someone who was familiar with the herbal tradition and was attempting to classify the plants known as “lunaria”. This person appears to have been certain that there was a distinction between lunaria and martagon. 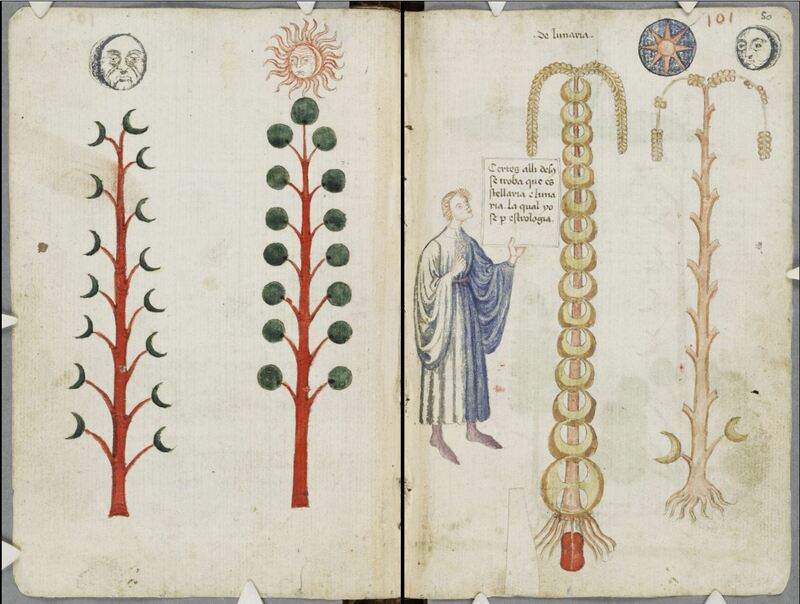 The later English writer looked at the illustrations from an alchemical point of view, conflated the two, and made the plant a metaphor for formal causation from the planets to the earth, in line with other tracts of the hermetic tradition. Already by 1542, when Leonard Fuchs was writing his famous herbal De historia stirpivm commentarii insignes, alchemy and formal causation between planets and plants had become discredited. In his entry referring to Botrychium (which he calls Lunaria minore), Fuchs wrote: Chymicorum nugas, quibus eius herbae usus frequentissimus est, lubens praetereo! [I will gladly pass over the nonsense of the alchemists, who frequently use this plant], and spoke only of its herbal properties. We too tend to ignore echoes of these ideas in botany because it is easier to think about a herbal route, from Dioscorides to Fuchs, through to Linnaeus and current taxonomic floras. Every so often, however, we are forced to recognise the residue of alchemy in botany; botany was strengthened by the incorporation of ideas that persisted in folk culture and common usage, and half the plants depicted above are still known as “moonwort” or “lunaria”. Voigts, L. E. 2008. “Plants and Planets: Linking the Vegetable with the Celestial in Late Medieval Texts.” In Health and Healing from the Medieval Garden, edited by P. Dendle and A. Touwaide, 29–46. Woodbridge. My experience as an intern at The Parker library; or a brief look into the retained importance of the physicality of manuscripts in an increasingly digital age.